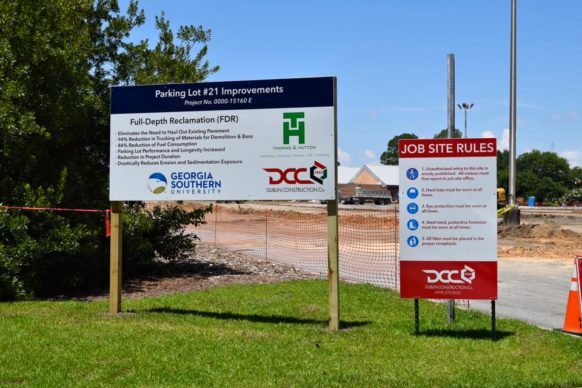 More Than Just Another Parking Lot | Dublin Construction Co., Inc.
Georgia Southern University – Less than two weeks after award and one week after the notice to proceed was issued, our crews and subcontractors are well into the Parking Lot #21 Improvement project at GSU. The existing pavement will be reclaimed through Full-Depth Reclamation and reused as a base material under a new layer of asphalt. The process drastically reduces fuel usage through reduced trucking, materials be placed in landfills by reusing the existing asphalt in the base, and exposure to soil erosion due to the elimination of having to expose the soil under the existing asphalt. The improved parking lot will feature new LED lighting, permeable paver islands with trees contained in tree wells, and an improvement in the existing grades to better direct storm water to inlets. We are proud to have been entrusted with this innovative and exciting project. Please watch for future updates, including time lapse footage of the entire project, once completed, from start to finish.